Irregularity in the arrangement of constituent particles in solids is called crystal defect or imperfection in solids. There are two types of crystal defects - Point Defects and Line Defects. Point Defects: Irregularities or deviation from ideal arrangement of constituent particles around the point or atom in a crystalline solid is known as point defects. Line Defects: Irregularities or deviation from ideal arrangement of constituent particles in entire row of lattice is known as line defects. (i) Stoichiometric Defects: It is a type of point defects which does not disturb the stoichiometry of solid. This is also known as Intrinsic or Thermodynamic Defects. Vacancy defects and Interstitial defects are found in non-ionic compounds while similar defects found in ionic compounds are known as Frenkel Defects and Schottky Defects. (a) Vacancy Defects: When some lattice sites left vacant while the formation of crystal, the defect is called Vacancy Defects. In vacancy defects, an atom is missing from its regular atomic site. Because of missing of atom the density of substance decreases, i.e. because of vacancy defects. The vacancy defect develops on heating of substance. (b) Interstitial Defects: Sometime in the formation of lattice structure some of the atoms occupy interstitial site, the defect arising because of this is called Interstitial Defects. In interstitial defect, some atoms occupy sites at which; generally there is no atom in the crystal structure. Because of the interstitial defects, the number of atoms becomes larger than the number of lattice sites. Increase in number of atoms increases the density of substance, i.e. interstitial defects increase the density of substance. 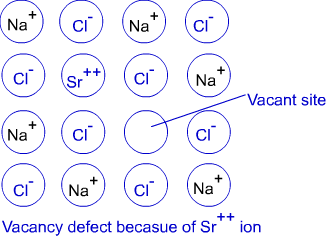 The vacancy defects and interstitial defects are found only in non-ionic compounds. Such defects found in ionic compounds are known as Frenkel Defects and Schottky Defects. (c) Frenkel Defects: It is a type of vacancy defect. In ionic compounds, some of the ions (usually smaller in size) get dislocated from their original site and create defect. This defect is known as Frenkel Defects. Since this defect arises because of dislocation of ions, thus it is also known as Dislocation Defects. As there are a number of cations and anions (which remain equal even because of defect); the density of the substance does not increase or decrease. Ionic compounds; having large difference in the size between their cations and anions; show Frenkel Defects, such as ZnS, AgCl, AgBr, AgI, etc. These compounds have smaller size of cations compared to anions. (d) Schottky Defects: Schottky Defect is type of simple vacancy defect and shown by ionic solids having cations and anions; almost similar in size, such as NaCl, KCl, CsCl, etc. AgBr shows both types of defects, i.e. Schottky and Frenkel Defects. When cations and anions both are missing from regular sites, the defect is called Schottky Defect. In Schottky Defects, the number of missing cations is equal to the number of missing anions in order to maintain the electrical neutrality of the ionic compound. Since, Schottky Defects arises because of mission of constituent particles, thus it decreases the density of ionic compound. (ii) Impurities Defects: Defects in ionic compounds because of replacement of ions by the ions of other compound is called impurities defects. In NaCl; during crystallization; a little amount of SrCl2 is also crystallized. In this process, Sr++ ions get the place of Na+ ions and create impurities defects in the crystal of NaCl. In this defect, each of the Sr++ ion replaces two Na+ ions. Sr++ ion occupies one site of Na+ ion; leaving other site vacant. Hence it creates cationic vacancies equal number of Sr++ ions. CaCl2, AgCl, etc. also shows impurities defects. (iii) Non-stoichiometric Defects: There are large numbers of inorganic solids found which contain the constituent particles in non-stoichiometric ratio because of defects in their crystal structure. Thus, defects because of presence of constituent particles in non-stoichiometric ratio in the crystal structure are called Non-stoichiometric Defects. Non-stoichiometric Defects is mainly of two types – Metal Excess Defects and Metal Deficiency Defects. These type of defects seen because of missing of anions from regular site leaving a hole which is occupied by electron to maintain the neutrality of the compound. Hole occupied by electron is called F-centre and responsible for showing colour by the compound. This defect is common in NaCl, KCl, LiCl, etc. Sodium atoms get deposited on the surface of crystal when sodium chloride is heated in an atmosphere of sodium vapour. In this process, the chloride ions get diffused with sodium ion to form sodium chloride. In this process, sodium atom releases electron to form sodium ion. This released electron gets diffused and occupies the anionic sites in the crystal of sodium chloride; creating anionic vacancies and resulting in the excess of sodium metal. The anionic site occupied by unpaired electron is called F-centre. When visible light falls over the crystal of NaCl, the unpaired electron present gets excited because of absorption of energy and impart yellow colour. Because of similar defect if present, crystal of LiCl imparts pink colour and KCl imparts violet. Zinc oxide loses oxygen on heating resulting the number of cations (zinc ion) become more than anions present in zinc oxide. The excess cations (Zn++ions) move to interstitial site and electrons move to neighbouring interstitial sites. Because of this zinc oxide imparts yellow colour when heated. Such defects are called metal excess defects. Many solids show metal deficiency defects as they have less metals compare to ideal stoichiometric proportion. The less proportion of metal is compensated by same metals having higher valency. Such defects are shown generally by transition elements. Thus, when metal present less than ideal stoichiometric proportion in a solid, it is called metal deficiency defect. Example: FeO is generally found in composion of FeO.95O. In the crystal of FeO, missing Fe++ ions are compensated with Fe+++ ions in order to maintain neutrality.